Make sure you check out the Curt sway control kits that help to reduce the lateral movements of the trailer caused by the wind. Sway control kits feature forged solid steel spring bars, hook-up brackets, hook-up chains, and pin & clips. The Curt control kit has a durable evergloss powder coat finish that resists rust and corrosion. Friction Sway control bars give you a smoother tow with less sway. Trailer towing with sway control bars is easier on the driver. It uses friction to resist any back and forth movement once it has begun and keeps your trailer and tow vehicles stable. Quick attachment to trailer frame and ball mount will get this installed on your vehicle in not time. Easily remove with two spring locking pins to quickly uninstall. The weight distributing hitch is not included. Any use with surge brakes is not recommended. 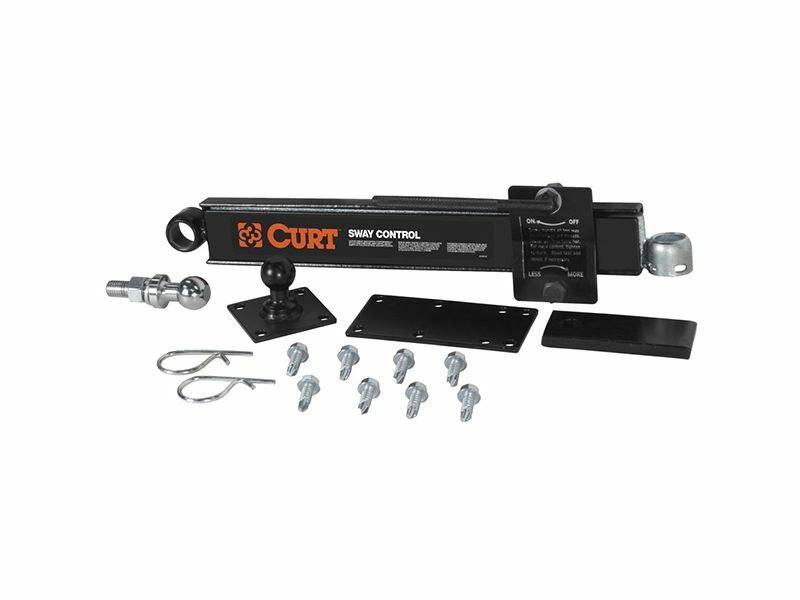 The Curt sway control kit includes a sway control unit, trailer mounted attachment ball w/hardware, hitch mounted attachment ball, weld-on tab to adapt for left-hand use or for use without weight distribution hitch, mount reinforcement plate, and attachment clips. There is also the option of purchasing just the trailer mounted sway control ball or the hitch mounted control ball. For additional information, please see the installation manual below. You may also call us toll free at 1-877-216-5446 or 701-253-5906.